Jazz-4-Sight is the first of what we hope will become an annual concert, partnering an area organization that focuses on supporting youth with our Jazz Studies Program. Who better to feature at such an inaugural collaboration than the great trumpeter Doc Seveninsen. Long known for his work with Johnny Carson and the Tonight Show Band, Doc will be performing with UofL's Jazz Ensemble I at Comstock Concert Hall at the School of Music. This is a must see/hear event! Jazz-4-Sight is co-sponsored by the University of Louisville's Department of Ophthalmology and Jazz Studies Program. All proceeds will go to supporting area youth with vision challenges and the students in the Jazz Studies Program. 1. Order and pay for tickets online: www.uoflalumni.org/Jazz-4-Sight. 2. Order by phone: Call Lee Ann Riffle – Alumni office: (502) 852-2373. 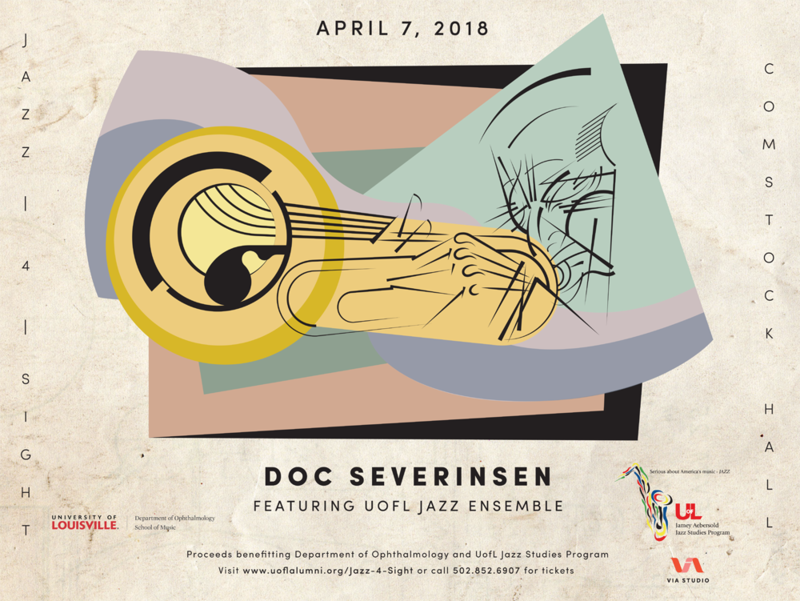 Doc Severinsen in Concert – Jazz-4-Sight, a benefit concert supporting the Jazz and Ophthalmology programs at UofL. Ticket Sales will support student scholarships. Saturday, April 7th. Concert time is at 8pm. Seats are $50 and general admission. Gala – there is a Gala dinner and silent auction before the event at the University Club. Tickets are $140, which includes dinner and a ticket to the show. Gala tickets can be purchased at the same website.